It's been two years since my sister moved abroad to work. 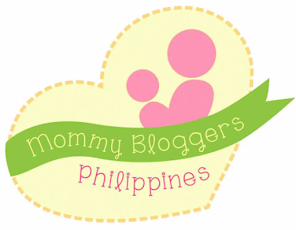 After a year, I began to be her personal shopper as I used my CC for her online purchases. It started with clothes and personal items that she can't find, that she had the interest to browse online stores. She then send the link to me so I can checkout the item for delivery at her place. That made me browse items for myself as well (*wink). Nowadays, we had the confidence to shop online because of the accurate measurement guide from the seller's site. We've been eyeing StyleWe, an online shopping platform that featured independent fashion designers. I like their unique, and the wide choices of different syles that promised high quality standards. 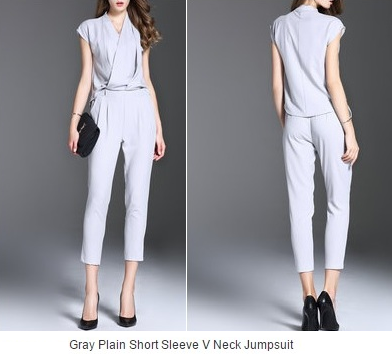 Ofcourse, they also offer trendy one piece jumpsuit whether for casual or summer wear fashion. 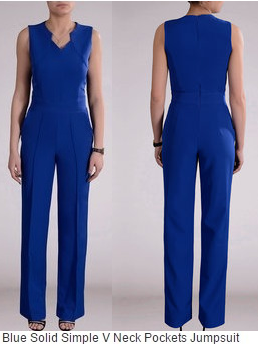 The selection of petite jumpsuit offered on the site ( I know) was waaay too perfect for me! I just love this classy Vneck short sleeve design to add up on my special occasion dresses. Oh well, being a WAHM for 3 years already, I now missed wearing smart casual dresses. I can only wished I have the perfect event to wear one of these. If you are looking for a unique and exclusive designer fashions, I recommend you checkout StyleWe and enjoy the SALE carnival from 15 to 50% OFF. I also like looking for products online but I prefer to buy it in store. I have several orders na kasi to different online shops, but the product especially clothes doesn't look and fit the way it is. So medyo nadala na ko... What I do is I look at products online, and then check it personally sa store before I buy it. The grey jumpsuit looks nice. I haven't tried wearing a jumpsuit or a playsuit before. I can only imagine the situation when doing business in the comfort room. I love online shopping. It is so easy and convenient. However for clothes and shoes, I still prefer going the stores personally, unless I am looking for a special item I cant find instores. Will check StyleWe. I LOVE online shopping! I'm definitely going to check this out. Online shopping is a great option these days.Mostly, I buy nursing clothes online.Those jumpsuits really look fashionable but as of yet can't really wear them. I love the gray one too. I checked their site and they're from UK pala. I haven't tried wearing jumpsuits yet because I know it's hard to remove when you want to pee. But they look nice and sophisticated. 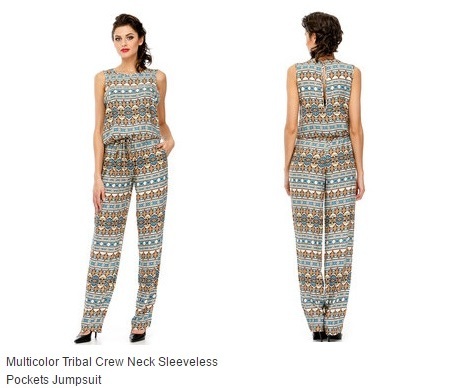 Love the v neck jumpsuit! Perfect for those business attire days at work. Will check them out! I love that Royal blue jumpsuit. So Chic! I work at home 95% of the time but I still love shopping nice dresses that I can wear to events. I regularly shop online too but never for clothes- I am afraid that the size would not fit me. Good thing that "StyleWe" as you said offers accurate measurements. I wonder if they carry clothes for big women too like me. My problem with online clothes shopping is I cannot fit the items. Usually kasi mahirap hulaan yun sizing nila. I'm a bit wary of shopping clothes online because of the sizes. Oddly enough, I fall into the in-between sizes more often than not which makes it harder to shop for clothes. Online shopping junkie here! Haha! I love the last pantsuit. That would be totally perfect for events and gatherings! Looks like an interesting site! First time I've heard of it but the jumpsuit selections looks amazing. The last one looks so chic! I haven't tried wearing jumpsuits though. Parang I can only pull it off by wearing those high heels that I'm not used to anymore. Oh i love those styles! They all look gorgeous! I love the blue jumpsuit! I wish I have more money to shop online, and if I do, I gotta check out this website, too. I love the look of jumpsuits but I hate wearing them. You know why, when you go to the bathroom. I have one jumpsuit in my closet. Would love to buy more but my priority now is nursing clothes. The ones you featured look really nice. I also like to look for things online but I read a lot of negative review about the clothes that they buy or maybe it's really not anlegit site. Will check this one. I love Sunday Dress. 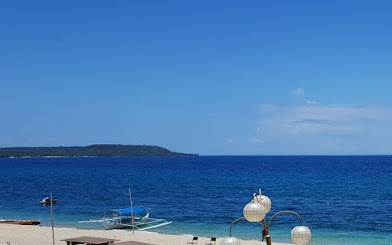 It's based in Cebu but their clients are all over the world. Celebrities often go to Jonah, the owner. These are nice jumpsuits. I wish I could carry one. it seems there arent bagay on me considering that I am too small. Might as well try and see for myself. Love those jumpsuits. How I wish they look nice on me. I think they wont fit me right because of I'm too.short.